Everyone remembers that sneaking childhood suspicion of a monster hiding under the bed or behind the closet. The Under the Bed Slot Machine features a brother and sister named Jesse and Jane and the not-so-imaginary monsters lurking in their room late at night. With 30 paylines, the Under the Bed Slot Game gives you plenty of ways to get paid. Join Jesse and Jane as they face the night and the monsters hiding under the bed. 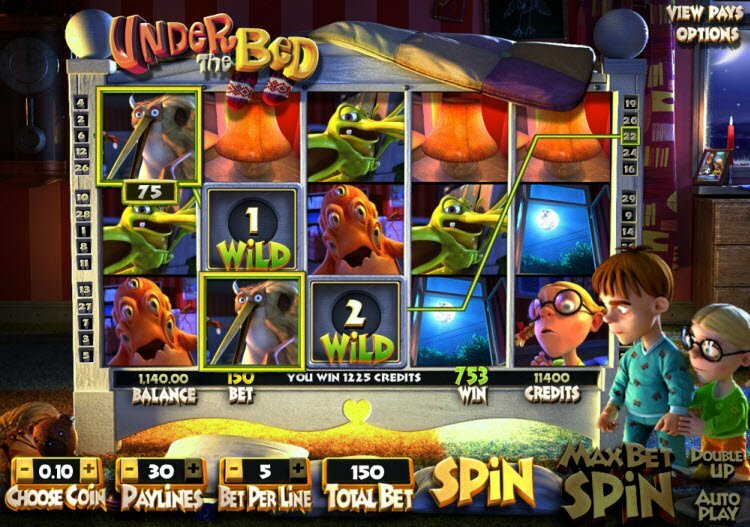 Powered by the Betsoft software platform, The Under the Bed Slot Machine features monsters and some monstrous payouts. The game has a number of special features including a Bonus Game, Sticky Wild, and Double Up Round. Unfortunately, the game takes some time to load, especially during Bonus Rounds. When playing online casinos, you can expect high quality from games developed by the Betsoft software platform. 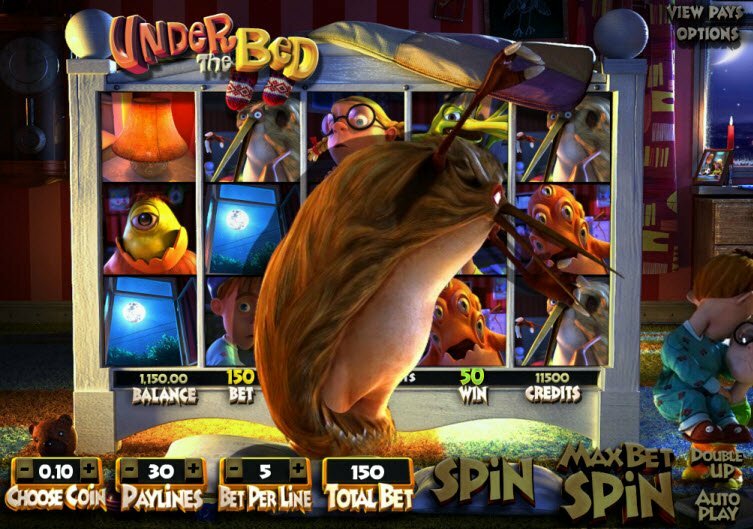 As Betsoft powers the Under the Bed Slot Machine, you’ll find excellent 3D graphics and seamless animation. Slot Reels contain images of delightfully gruesome monsters that come to life during winning combinations. As you play, you’ll hear suspenseful music that fits the theme perfectly. If The Mysterious Door symbol lands on the middle position of the center reel, you unlock the Free Spins Mode. Here you’ll earn 12 Free Spins in the lopsided monster bedroom. The Under the Bed Slot Machine not only contains high-quality graphics. This slot machine has got the goods when it comes to game features. You’ll find an Under the Bed Slot Bonus Round along with some fun opportunities to win Free Spins and increase payouts. Landing a winning combination of any monster with a special rim around it triggers the Sticky Wild Feature. During this feature, the rimmed symbol will flip over to reveal a Wild Symbol with a random number. This position on the reel will remain wild for the number of spins indicated on the space. If you land on 3 or more Bed Symbols, you enter the Bonus Round. During this game, Jesse and Jane need help fighting off the monsters hiding under the bed. If The Mysterious Door symbol lands on the middle position of the center reel, you unlock the Free Spins Mode. 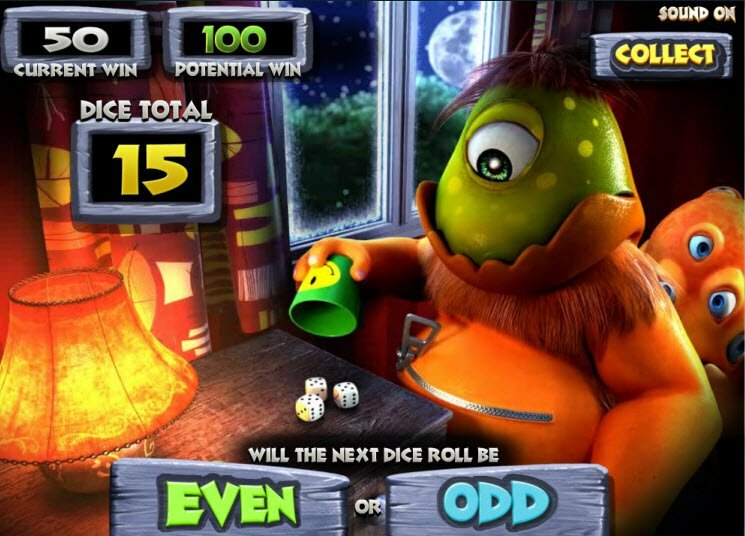 Here you’ll earn 12 Free Spins in the lopsided monster bedroom. After any winning combination, you can choose to play a game of Double Up for a chance to double your winnings. Simply try and guess whether the next dice roll will turn out even or odd.